The Wednesday attack, was planned and carried out by Syed Rizwan Farook, 28, and Tashfeen Malik, 27, who had been married two years and had a 6-month- old daughter. One day after the FBI announcement, an Islamic State online radio broadcast praised Farook and Malik as supporters of the terrorist group. “Two followers of Islamic State attacked several days ago a center in San Bernardino,” media reports quoted the group from the broadcast. The couple was killed in a gun battle with police roughly seven hours after the initial shooting at the Inland Regional Center, which provides treatment for people with developmental disabilities. Investigators had been reluctant to classify the shootings as terrorist related because they occurred during a holiday gathering at Farook’s workplace, and there were reports he left amid a dispute with a co-worker before returning with his wife and multiple weapons. But on Friday, local FBI officials finally made the connection. “We are now investigating these horrific acts as an act of terrorism,” David Bowdich, assistant director in charge of the FBI’s Los Angeles field office, said at a news conference in San Bernardino. Bowdich declined to provide specifics, but confirmed he was aware of a Facebook post made by one of the suspects pledging allegiance to the ISIS terrorist group around the time of Wednesday’s shooting. He said “there’s a number of pieces of evidence that have pushed us off the cliff” to proclaim the investigation to be a terrorism probe. The FBI was initially in charge of the investigation and officials said federal authorities will continue to work in “lockstep” with local law enforcement on what is expected to be a lengthy probe. Also on Friday, authorities finally pulled the rented SUV off the street where the couple were killed and into a secured storage area. And, reporters gained access to the Redlands townhouse where the couple lived, assembled bombs in a rear garage and amassed a large cache of weapons and ammunition. Investigators also found evidence the two deleted their social media accounts and destroyed their mobile phones the day before the shootings. “None of the family members had any idea that this was going to take place,” attorney David Chesley said during a Friday news conference. They were “totally shocked” by what happened. On Wednesday morning, Farook left the couple’s infant daughter with his mother, claiming he was taking his wife to a doctor’s visit and didn’t want to bring the baby along, according to Hussam Ayloush, the executive director of the Council on American-Islamic Relations-Los Angeles. Farook was a five-year employee of the San Bernardino County public health agency, which was holding a holiday party when the shooting erupted. The Los Angeles Times reported that Farook traveled to Saudi Arabia last year and spent nine days there before returning with a new wife he met online. The Times and other media outlets, citing a senior government official who spoke on condition of anonymity, said Farook was in contact with a number of extremists and at least one person being monitored by federal officials, a Pakistani named Roshan Zamir Abbassi, who is an assistant Imam in San Bernardino, where Farook worshipped. However, Abassi told The Times he barely knew Farook and only exchanged occasional hellos and goodbyes. Law enforcement sources told NBC News that Malik pledged allegiance to ISIS leader Abu Bakr al-Baghdadi in a statement on Facebook just before she and her husband carried out Wednesday’s rampage. 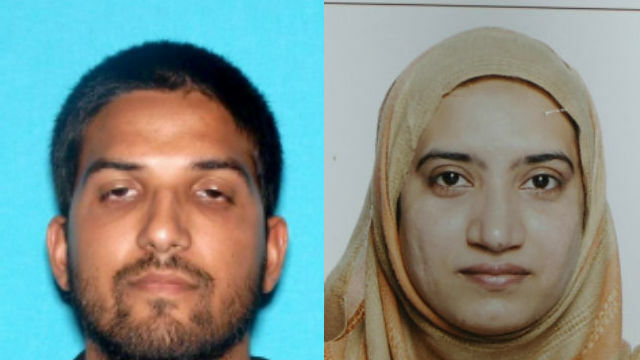 Investigators are reported to be looking into whether the Pakistan-born Malik radicalized her husband. At a Thursday morning news conference, David Bowdich of the FBI said Malik came to the United States with the U.S-born Farook in July 2014 on a work visa and had a Pakistani passport. The couple married after arriving in the U.S., which enabled her to gain legal permanent resident status last year. The attack has brought new attention to the previously obscure K1 visa program, which is reserved for the fiances of U.S. citizens. Some advocates for stricter immigration enforcement are calling for investigations into the nation’s visa screening process and for a halt to the nation’s Syrian refugee program. “New information coming to light regarding Tashfeen Malik’s citizenship reaffirms the fact that proper screening and vetting those coming into our country, whether with a visa or as a refugee, is not always possible,” Dan Stein, president of the Federation for American Immigration Reform, which advocates for stricter immigration laws, said in remarks quoted by The Times. The K1 visa permits the foreign-citizen fiance of a U.S. citizen to travel to the U.S. and marry his or her sponsor within 90 days of arrival. It is one of dozens of visas that allow foreigners to enter the U.S.
State Department spokesman Mark Toner said K1 applicants, like other visa applicants, undergo an extensive counterterrorism screening that includes checks based on fingerprints and facial recognition software. Meanwhile, the FBI has established a nationwide toll free line for tips regarding the massacre. It’s (800) CALL-FBI (Option 4) or (800) 225-5324 (Option 4).